The GS1000i is Grado's finest effort to date. 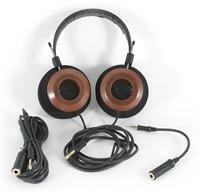 This new headphone incorporates a redesigned driver, a new and larger wooden housing and much larger foam cushions that are extremely comfortable. The new cushion design actually creates a "room" for the ears to sit in, creating a larger soundstage and greater spatial experience for the listener. It was most important to design the correct balance between the driver and Grado's new wooden driver housing to give the resulting sound that they desired. By creating this "room" for the ears, positioning of the cushions with regards to the ears (i.e., forward or back) is somewhat critical in finding the absolute sweet spot. The newly designed driver delivers a top-to-bottom sound that is extremely balanced. The mass distribution within the new larger wooden housing has also been improved. The way the new driver and wooden housing work together to move air and react to sound vibrations are less affected by transient distortions. The new GS1000i will provide improved control over the upper and lower frequency spectrums while better supporting Grado's world-renowned midrange. The GS1000i retains a sound that is pure Grado – rich, full-bodied vocals, excellent dynamics and an ultra smooth top end. The presentation is very detailed, the bass is deep and the music is very tight and non-fatiguing, all with a soundstage that is huge and unbelievable. Simply stunning.